See what’s playing on SPOT.ph’s April playlist. (SPOT.ph) On our April playlist: The perfect beach track from Urbandub, a trippy tune from rock artist Miguel Escueta (that could be played on Gossip Girls or Vampire Diaries, we hear), plus songs from Manila-bound Switchfoot, The Script, and more! The 26-year-old musician uses three words to describe this song: "organic, fresh, and real." And he's totally right. More than its moving lyrics, "Now It Starts" has a catchy melody that'll have you singing along to its upbeat tune. This feel-good song is the perfect soundtrack to weekend road trips, lounging around at the beach, or just about any sunny summer day. Fun fact: You just might hear this song on Gossip Girls, Smallville, or Vampire Diaries. "Now It Starts" was signed in the U.S. and is being pushed to play in American T.V. shows and films. This Grammy-winning alternative rock band is known for heavy guitar-laden tunes and their ability to connect with the audience through their music. "Always," a melodic, stirring tune from their album Hello Hurricane has beautiful, moving lyrics-definitely one of those songs you should have on your playlist on an emo day. Fun fact: Switchfoot is set to play in Manila on April 30 at the Phil Sports Arena. Tickets are available at Ticketworld and SM Tickets. With news of soul ensemble Juan Pablo Dream disbanding, it's only right that we pay homage to the local music scene's mod masters by including "Nice Place" on this list. Known for deep-soul songs with sax and trumpets, Juan Pablo Dream’s upbeat ditty (one of the 11 original songs from their album Soul Up!) will make you get up and dance, no doubt. Fun fact: The band's name was inspired by Formula 1 racecar driver Juan Pablo Montoya. Heat up summer with a song from the woman we all love (or hate). The controversial fashion-forward artist's song "Born This Way" gets a pick-me-up from DJ White Shadow, making it the ultimate party-pumping tune. Packed with sick beats and laced with Gaga's vocal stylings, this remix can easily become this summer's clubbing anthem. Fun fact: This song is part of a limited edition four-track CD that also features an L.A. Riots remix and Chew Fu Born to Fix remix. Jaco Benin's first single from his debut album, Ako Naman, is a remake of local band Moonstar 88's "Torete." The melodic song showcases the young musician's guitar-playing skill and relaxed vocal, suited for easy listening summer afternoons. Fun fact: The 21-year-old singer-songwriter is the son of popular OPM band Side A's Joey Benin. The Script has the uncanny ability of knowing exactly how you feel. Could it be because this Dublin-based trio's songs are mostly about love and heartbreak? After hits like "The Man Who Can't be Moved," "Breakeven," and "For the First Time" comes "Nothing," a single from Science & Faith that showcases the band’s strengths: vocalist Danny O’ Donoghue's powerful voice, fresh melodies, and heartfelt lyrics that can make a tear fall. Fun fact: Catch the Script perform in Manila on April 16 at the Araneta Coliseum. Tickets are available at Ticketnet. 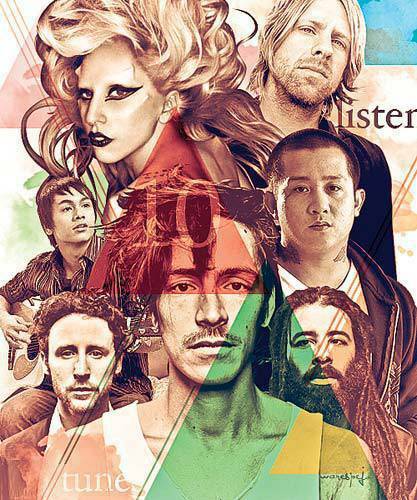 Fun fact: Incubus has been to Manila twice. Now don't we all wish they would make a third appearance? Performed by the Warblers in Glee's Original Song episode, their version of Pink's hit "Raise Your Glass" is the perfect tune to celebrate vacay season. Softer than the original, we love how Glee’s Filipino-Irish singer Darren Criss lends his soulful vocals in the Warblers’ version and the song's infectious melody. Fun fact: Mark your calendars-Glee’s All-Warblers album is set for release on April 19. An old song from one of the best and most followed rock bands in the local music industry, "Life is Easy" is infused with reggae beats and feel-good lyrics like, "'cause today is fine, no troubles in my mind" that can easily put you in a positive mood. From the album Under Southern Lights, this steady Urbandub song is the perfect accompaniment to a sunset session, ice-cold beer in hand. Fun Fact: Watch Urbandub's concert on April 8 at the Music Museum where the band will play their latest single "Sending a Message." Rock and Roll Hall of Famers R.E.M. 's song "Discoverer" from Collapse Into Now, their latest album released last month, is thoroughly criticized by music aficionados-they either love it or hate it. But for what it's worth, it's R.E.M., how can you not listen to their latest song? Trippy guitars and frontman Michael Stipe's distinct voice are standouts. Fun Fact: R.E.M. has been around for more than 30 years. 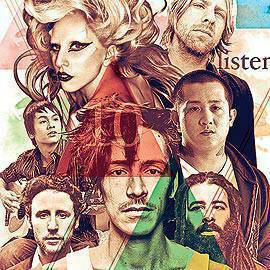 10 Tunes To Listen To This Month Aprilplaylist Newsongs Songsforapril Switchfoot Thescript Miguelescueta Juanpablodream Jacobenin Ladygaga Bornthisway Thewarblers Glee Darrencriss Incubus R.e.m.